this week we are thrilled to welcome back our lovely friend and devoted ♥JINGLE BELLE♥ miss leslie... aka the crooked stamper! if you've been playing along with us this year you've probably laughed as hard as we have at her hilarious tales of cardmaking, and you've probably gotten some nice comments on your own holiday cards from her, as well. but if you need a little more leslie, why not check out her etsy shop, or drop by the fabulously inspiring shopping our stash weekly challenge blog each tuesday? 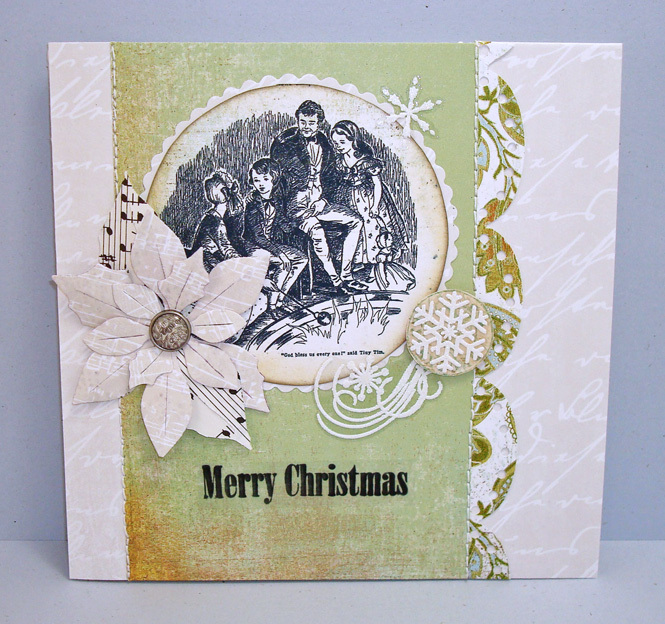 Leslie says, "I have a piece of pretty paper in my collection with a mottled background and shiny gold-embossed-impressed script words. Soooo pretty, and I thought it would make a cool Christmas card. Well. you know how those Belles are always telling us they would like us to suggest ideas for future challenges*, right? Gold... Midas... a challenge called the Midas Touch! :) And I used that paper as my background! I tried to stay with all gold for my card, in the Midas spirit!" 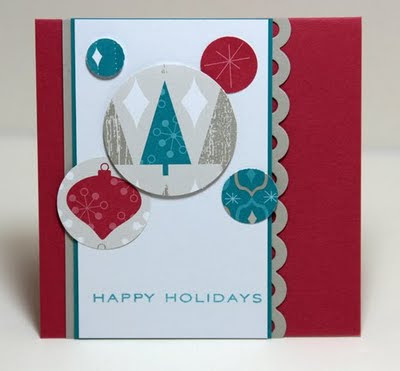 Stephanie says, "I decided to fully embrace silver with my card this week ... I pulled out my "metallic" scraps folder and went to town. 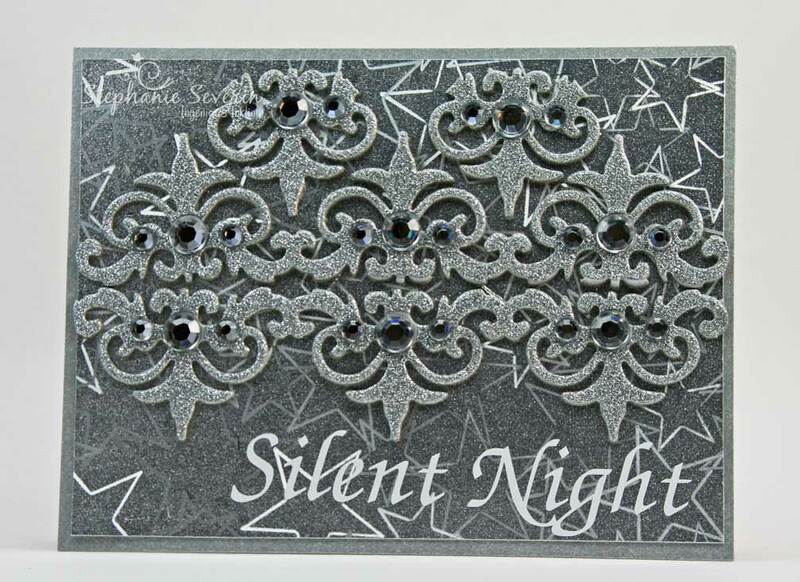 Silver metallic card base; silver star paper (that is sort of holographic, so it changes when you move it); and silver glitter border cut into pieces. I finished with a white holiday sentiment rub-on from EAD Designs ... this baby sparkles." and now it's time to see how ♥YOU♥ will embrace the midas touch! put on your thinking caps, pull out your metallic papers, baubles, bangles and beads... whatever it takes to rock the "heavy metal" between now and 6pm EST, next wednesday, august 31st. the keyword in our flickr group and for posting in galleries is JB35. *we absolutely always ♥LOVE♥ to hear your ideas for future challenges, email us any time! jinglebellesrock @ hotmail [dot] com! It was so fun seeing all of the fantastic interpretations of this weeks Clean & Simple Stamping Sketch ... so many fabulous possibilities. And while some of you found the Clean & Simple style a bit painful (ahmmmm Lauren), others embraced it full force. A huge thank you to our Lovely Guest Stars & sketch providers this week from the Clean & Simple Stamping Blog. used an unexpected holiday color palette that made me smile (orange for winter ... how fun is that!)... and I loved how all of the little snowflake circles surrounded her sweet little snowman. used a combination of ornaments with subtle snowflakes to produce and elegant CAS design ... and she used a *kitchen fork* to tie those perfect little bows. 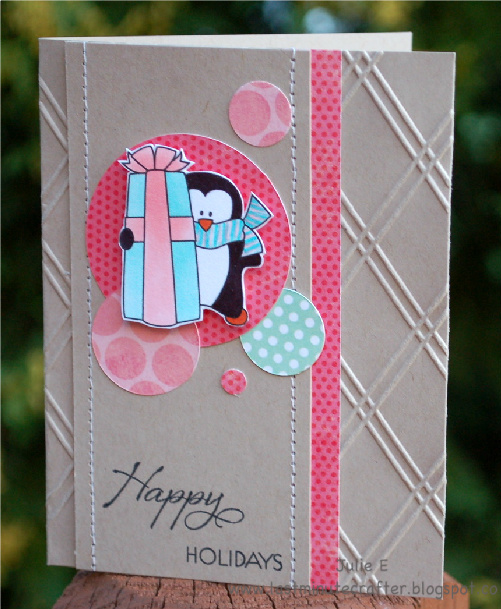 combined all different sizes of polka dots in her card for design continuity ... and kept it CAS (but far-from-plain) by adding a understated embossed design and a bit of stitching. If you haven't skipped through the sketch gallery to leave a little jingle belles love ... please do ... you won't be disappointed. And make sure you check back at midnight for another Lovely Guest Star ... and more holiday card making inspiration ... and in case you're counting ... just 17 weeks until Christmas. This week we are thrilled to be partnering with the fabulous designers at the Clean & Simple Stamping Blog who designed a great Fall to Layout for us to use for this week's Jingle Belles prompt. 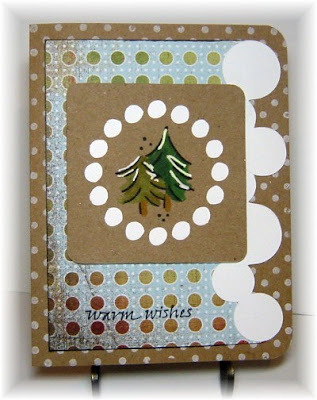 We are also asking that you also incorporate a clean & simple style with your design & then make sure you link-up your card here & at the Clean & Simple Stamping blog. Lauren says, "i predict my card will be the least "clean & simple" one we see all week... but JB regulars will realize how very verrrrrrrry pared down this is for *ME*! downright minimalist, in fact, lol! :) i re-sized a vintage book image for my centerpiece, and kept my patterns as un-obtrusive as possible, with lots and lots of white to help with the "clean" feeling. since i am a remedial stamper, i applied my sentiment to a clear label and attached it to the card at the very end!" Stef says, "To help keep my card clean & simple, I went with one stamp set and a monochromatic palette (can you ever go wrong with purple for the holidays?). 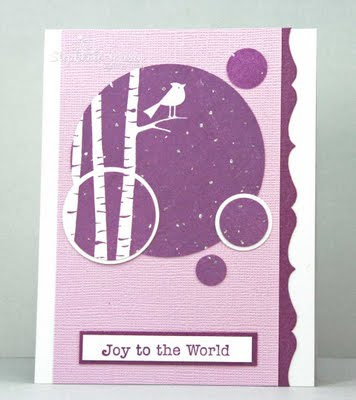 I stamped the image from Hero Arts Merriest Christmas Wishes twice in warm violet chalk ink. I used the second image to punch out the spotlighted circles. I finished with tiny touches of glitter pen for the sky." 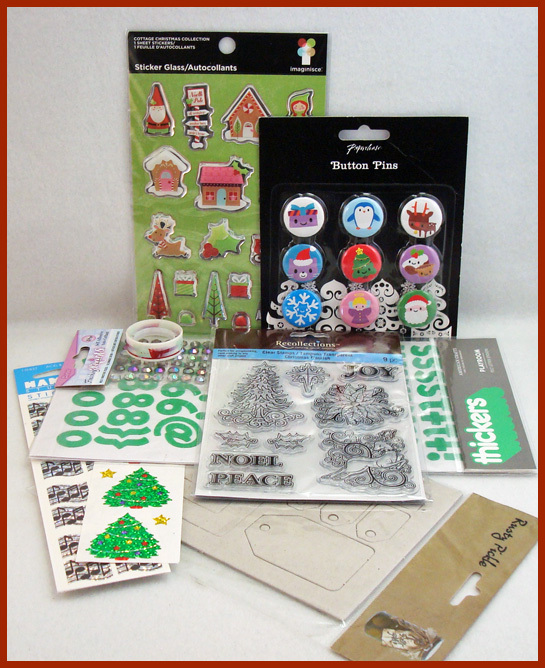 And since we're sharing the challenge spotlight this week with the Clean & Simple Stamping team, we though it would be fun to offer a little pile of goodies for one random participant. So now it's your turn to show us what you can create with this Clean & Simple Stamping Sketch (which I realize is more of a challenge for some ... ahem Lauren ... than others). Inlinkz will be open until 6pm (EST) on Wednesday, August 24th ... use keyword JB34 for our Flickr gallery & other galleries too. wow, wow, ♥WOW♥ jingle belles! every single time we think we could not be more impressed by your collective card-making skills, you come back and blow us out of the water AGAIN!!! each and every BLINGTASTIC card this week was a masterpiece in its own way... if you've not yet cruised the gallery you're in for a treat!!! 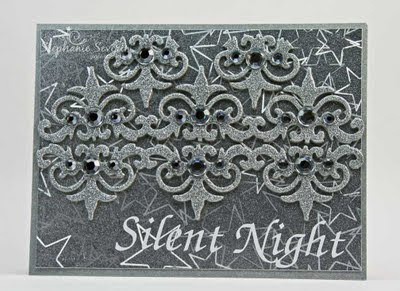 it was pretty near impossible to only choose THREE amazing cards to show you, but each of these BLING ON THE HOLIDAYS in particularly cool and creative ways!!! i don't think it will shock any ♥JINGLE BELLE♥ to hear that both stef and myself enjoy a bit of bling year 'round! of course, in a christmassy context, sparkle is particurlary desirable and especially easy to pull off; after all, on just the tree alone there are shiny ornaments, twinkly fairy lights, and glittering tinsel that have already done half the work for us! 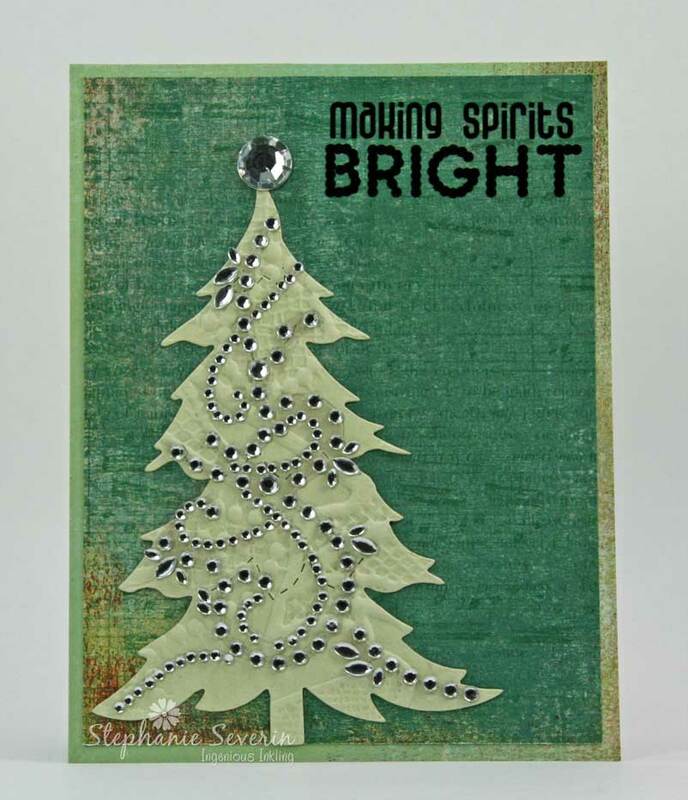 this week, then, we're asking you to bling on the holidays by making cards which incorporate jewels, gems, beads, studs, pearls, glitter, stickles or *ANYTHING* sparkly! 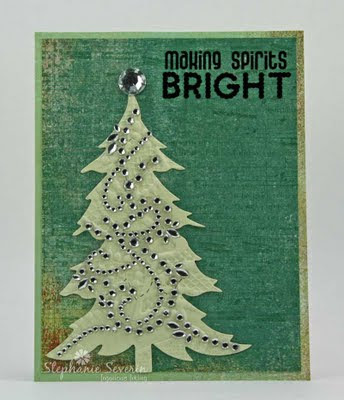 Stef says, "One of my favorite things at Christmas is sitting in the dark and watching the lights twinkle on the tree ... that is the effect I wanted to create with my card. I die cut my Sizzix Christmas Tree #2 from embossed specialty paper, and then cut apart several bling flourishes to wrap the lights around the tree. 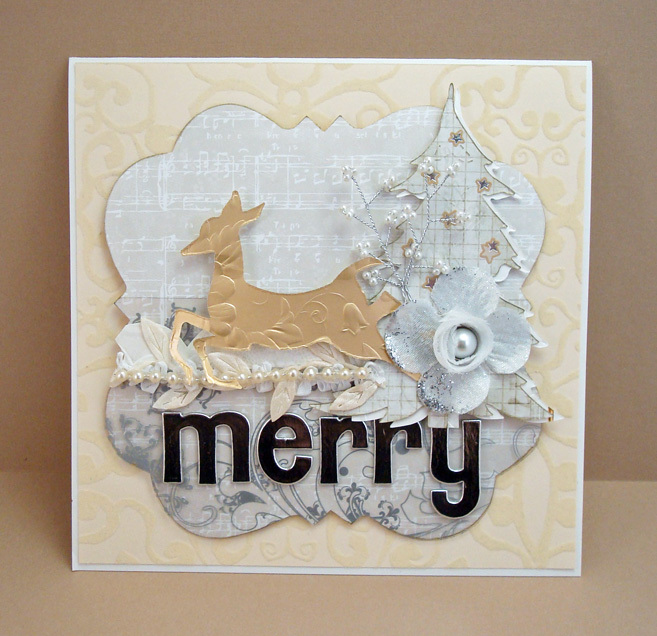 I softly stamped Hero Arts new Collage Music Background and finished with an EAD Designs Rub-on. I kept it clean, so the focus is on the bling." and now it's time to see what you will do: keep it elegantly C&S with just one dramatic rhinestone flourish, or load on a zillion sparkly embellies. anything goes in terms of style, color, and theme, but BLING ON THE HOLIDAYS and let your best ideas shine! inlinkz will be open until 6pm (EST) next wednesday, august 17th. keyword for galleries and our flickr gallery is JB33. What a fabulous gallery of Shape-Up cards we have this week ... so many clever creations that it almost makes me want to do a few jumping jacks ... don't get carried away ... I said ALMOST. 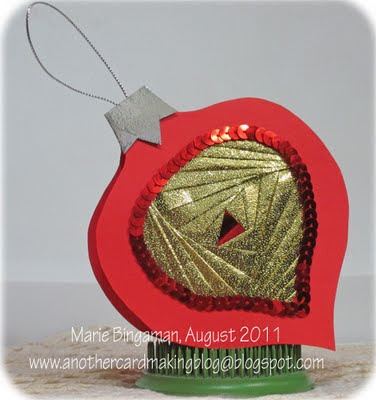 "Marie not only used a lovely ornament shape, she also added some fabulous iris folding, sequined trim, and silver topper ... a shaped-card that's also a wonderful holiday decoration." "Rose's cute little house made us smile ... she decorated it inside & outside for the holidays with a bit of snowy glitter on the rooftop"
"Designeal created this wonderful star album that can be a card ... and an album ... and even a holiday decoration ... what a versatile shaped creation." 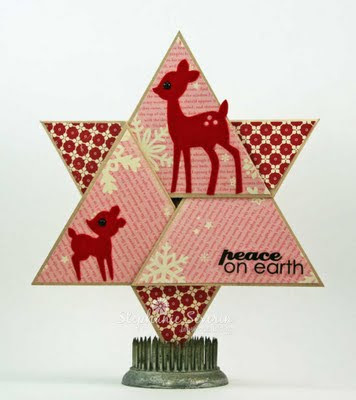 I know we say it every week ... but seriously ... if you haven't taken the time to wander through this week's gallery and leave a little jingle belles love, you should ... so many inspiring cards to get those holiday design ideas flowing. Make sure you come back and join us at midnight for another fun holiday card prompt (actually, we'll be in bed at midnight ... but our jingle belles alter-egos will be awake to make sure the prompts go on). This week we're asking you to Shape-Up for the Holidays ... no, you don't have to do any jumping jacks or run around the block to work off that holiday meal ... you just have to make a card that is a shape other than the standard rectangle or square. Here's what we came up with this week. 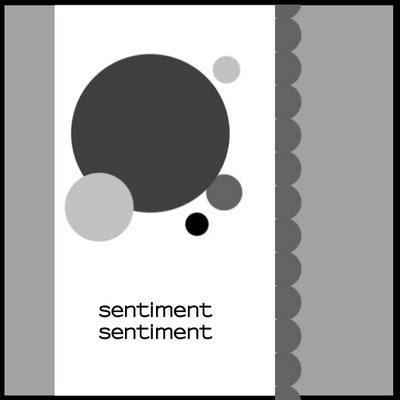 Lauren says, "i wanted--for once--to forego my usual 'shape' strategy of making a round card in favor of something a little more interesting, but i was stumped as to what i could use for a template. then i remembered my digital files, specifically these adorable jolly lil friends stickers by minda terasawa! 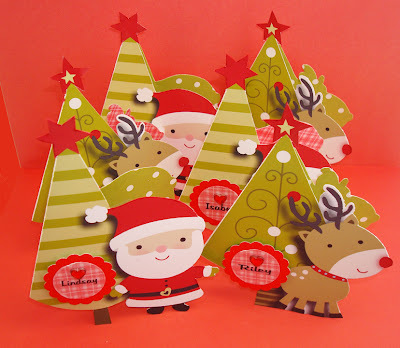 i layered the characters and trees digitally, printed them on glossy photo paper, then scored and hand-cut the resulting shapes... times SIX... so that all of my MY jolly little friends (& nieces!) will each get one at christmas time! more detail of technique on my personal blog." 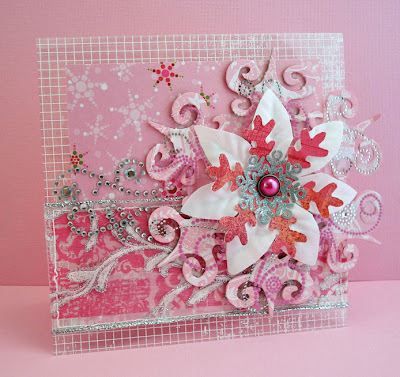 Stephanie says, "When I saw Lynn's Star Fold Card, I knew the design would make a fantastic holiday card. I followed the easy instructions in the video, and was able to make it come together on the first try (not the norm for me). I used October Afternoon's Good Cheer Collection, EAD Sticker Sentiments, and red flocked reindeer stickers to finish my design. 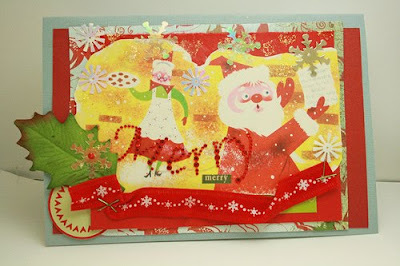 You can see the inside of the card on my personal blog." Now it's your turn to Shape-Up for the Holidays ... break out those die cuts ... fussy cut around photos ... try some fun folds ... paper piece together Christmas icons ... whatever you decide to make ... just make sure you stretch your creativity & have lots of fun Shaping-Up (hey, it's got to be more fun than jumping jacks). Link up before 6pm (EST) next Wednesday, August 10th; keyword for galleries and the Flickr group is JB32. 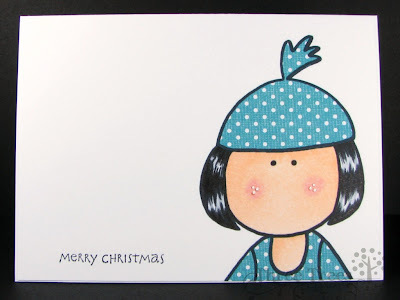 "I have enjoyed EVERY blue Christmas card entered in this week's Jingle Belles gallery. Each card is unique and it certainly made choosing only three very difficult! Thank you ALL for participating in my challenge; it was great fun visiting your blogs!" june says, "Judy's bold papers made me grin! I always center my image in a frame or mat either perfectly horizontal or vertical, so Judy's Santa Claus eagerly jumping out of his frame made me giggle." 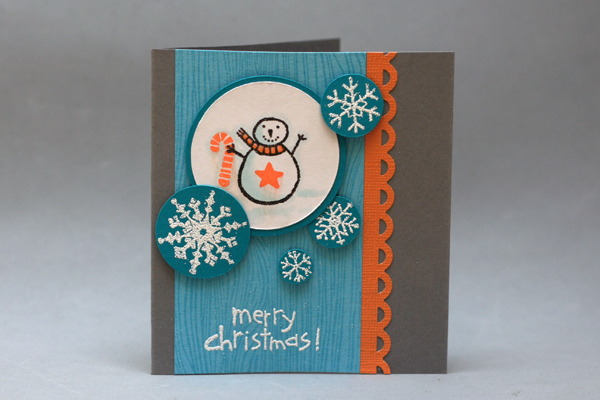 june says, "Barb entered two lovely cards, but her snowman card is particularly clever! The dynamic white fibers recreating the feel of snow spray when skiing downhill totally blew me away." an enormous THANK YOU to every belle who played along this week. if you have yet to cruise the blue christmas gallery, do scroll down and give yourself that treat! extra special thanks to our extra special and particularly lovely guest star june houck, whose help and support cn never be overstated! be sure to check out her blog, simply elegant papercrafts, and offer her congratulations on her new DT gig at the pumpkin spice online shop! we'll be back at midnight with a brand new prompt that we hope will inspire and delight you! xoxoxo till then!